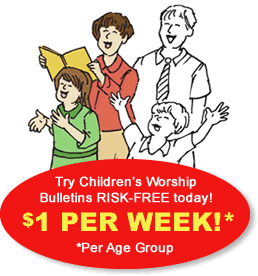 Give children a church bulletin of their own each week. Let them know that worship is for them, too. Children's Worship Bulletins can be customized with your church's contact information, identity and any other messaging. This personalization helps let your kids know that your church cares about them, giving them a sense of belonging in the worship experience. Our children's church bulletins teach the important truths for today from the many relevant messages throughout Scripture. And our library of Children's Worship Bulletins is extensive. We continually add new bulletins, bringing stories from the Old and New Testaments to life in fun, new ways. We've recently added bulletins covering Special Days to our library. Now you can find children's church bulletins about Father's Day or almost every other popular holiday. All Children's Worship Bulletins come with answer keys, and many bulletins are available in color for that special occasion or important event. In this article, we'll show you how easy it is to create age-appropriate classroom activities for any children's church event using one of our children's church bulletins about Father's Day. Children's church bulletin about Father's Day for ages 3-6: David also said, "Watch how you live and walk faithfully before God"
Explain the activity, "Our dads have a big job, don't they? They love and protect us and teach us what we need to know to grow up. Today, we're going to read about a father in the Bible who wanted his son to grow up to be a godly man for Israel. While I read our Bible lesson, please solve the puzzle 'David also said ...' Then, we'll work together to think of other things that our fathers teach us, just like the pictures in today's puzzle." Read aloud 1 Kings 2:1-4 while the children work on their puzzles. Continue, "Now, look at our puzzle today. Can you describe what is happening in each pair of pictures? Which pictures show the little boy or girl following God's ways, laws and commands just as David was teaching Solomon to do?" Continue, "Let's see how many ways we can think of that our fathers teach us about following God's ways." Write several of the children's answers on the board. Continue, "I'm going to give everyone a piece of paper. Choose one of the ways that our fathers teach us about following God's ways that we've written here on the board, or think of something on your own, and draw it on your paper." Allow the children to finish their drawings. Ask for volunteers to share their picture with the class and explain what they've drawn. Give each child a bulletin, pencil, glue stick, piece of cardstock and a pair of scissors. Explain the activity, "Our dads have the very important job of teaching us how to succeed in life. Today, we're going to hear about how one father in the Old Testament taught his son about life. Please solve the puzzle 'David also told his son ...' while I read our lesson. Then, we'll make a badge to help us remember a verse from our lesson." Read aloud or have the children read aloud 1 Kings 2:1-4 while the children work on their puzzles. After reading the story, ask for a volunteer to share the answer to the puzzle. Continue, "First, I want you to transfer the arrows from the bottom part of the puzzle to the disk above. That is, draw an upward arrow between the 'WA' at the center of the disk to the 'LK'. Then, draw a right-upward arrow between the 'LK' and the 'FA'. Continue until you've marked all of the arrows in the disk." After the children have finished marking the arrows in their disks, have them cut out the disks and glue them to the pieces of cardstock. Have them trim the cardstock to match the shape of the disk. Instruct the children to write the reference to the verse (1 Kings 2:4) on the back of the cardstock. Remind everyone, "Use this badge to help you remember the verse, 'Walk faithfully before the Lord,' and its reference, 1 Kings 2:4.